Quepos Fishing Charters at its Best! Our Luxury Fishing Boats in Quepos, Costa Rica offer The Best Fishing Charters in Quepos, Manuel Antonio, Costa Rica for deep sea, offshore charters and inshore trips. 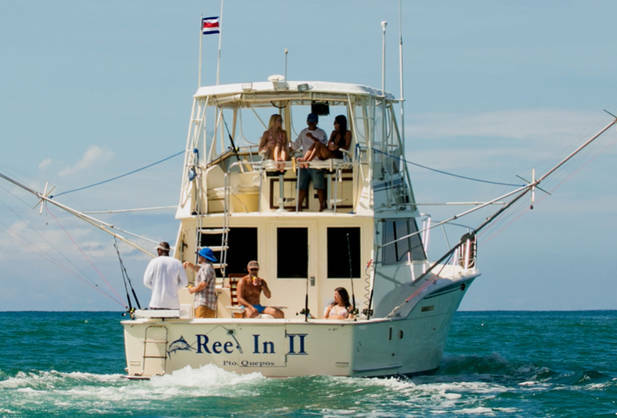 Experience a World Class Sport Fishing experience in Quepos Costa Rica aboard either of Luxury Fishing Boats. We have the capacity to take small and large groups to do offshore fishing and inshore fishing. There is a lot of room to sit back and relax to view all of the action while fishing in the grounds of Quepos, Costa Rica. It is truly a unique experience to fish aboard our Luxury Yachts. When you are 25 to 30 miles offshore for 6 to 8 hours, you will feel the Costa Rican heat and humidity, this is not a problem on our Luxury Yachts. Both boats have A/C Cabins so you will stay cool and dry during your fishing adventure. Inside our luxury yachts you will find many areas in which you can rest and enjoy with your friends and family. “Reel In I” is a 36’ Bertram, which has been repowered with twin 500 HP engines. 1,000 Horse Power makes her very fast, getting you to the fishing zones more quickly, and thus affording you more time to catch fish. 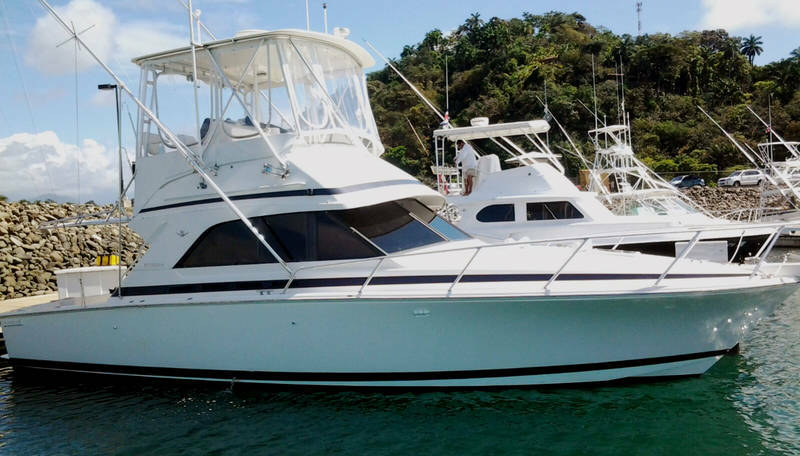 She is fully air conditioned, so you can relax in the cool comfort of the yacht’s interior, after the adrenaline rush of “reeling in” that big Sailfish, Marlin, Dorado, or other Big Game fish, which abound in the waters off Manuel Antonio, Quepos, Costa Rica. Her spacious, comfortable flybridge offers a great vantage point, from which to watch and photograph dolphins, as well as all of the exciting action, as your fellow fishermen reel in their fish. Both boats are equipped with High Definition GoPro cameras, to capture your thrilling experience, so that you can relive it, and share it with friends. You’ll want to show the videos to everyone, just to prove that your not making up a fish tale, when you tell them how big the fish were. The Bertram has an elegant, clean “Head” (bathroom), with all the privacy and comfort you’d expect on a Luxury Yacht. “Reel In II” is a 42’ Hatteras, every bit as luxurious as the Bertram, but even larger. It’s perfect for bigger groups, with the same comfort of a fully air conditioned interior. She has a large settee and table, which can accommodate 8 people dining, in comfort and style. The food aboard both Luxury Yachts is the same, and typically includes a hot entree of either Chicken, fresh fish, or Beef. We pride ourselves in offering quality food, in the tradition of the great cruise ships, but with a homemade touch. We like to say; “There are no ham and cheese sandwiches served on our Yachts”. Nothing works up an appetite like a day at sea, and our galley will satisfy the hungriest of anglers. Catching big fish is just part of the experience of a day at sea, and it’s a joy to be able to stay cool, dry and comfortable aboard either of our stable, spacious, air conditioned Luxury Yachts.